• Stay on the sidewalk and give the floats plenty of space. • Don’t approach the animals. The horses may be beautiful, but they can be unpredictable, especially when there is so much going on around them. • Don’t let your kids race toward a moving float to retrieve any candy on the ground. Wait until it is safe. • If you’re handing out candy, please have walkers approach spectators to hand out the candy. Don’t throw it from your vehicle. • If you’re walking beside your float, watch your footing. There may be ice, horse droppings, etc. that could cause you to lose your balance. • Don’t allow children on your float to hop on and off the float while it’s moving. With everyone’s cooperation, we can ensure our parade remains a safe and joyous occasion for everyone. Thank you. Honourable Mention: Tibben Farms Inc.
D’s Collision took home the prize for the Most Lights category in 2018. D’s Collision took home the award in our Most Lights category in 2018. The parade is assembled in the parking lot of the North Dundas Township Office at 636 St Lawrence St, Winchester. Into town on St. Lawrence St. Turn right onto York St.
Head through town all the way to Dawley Drive. 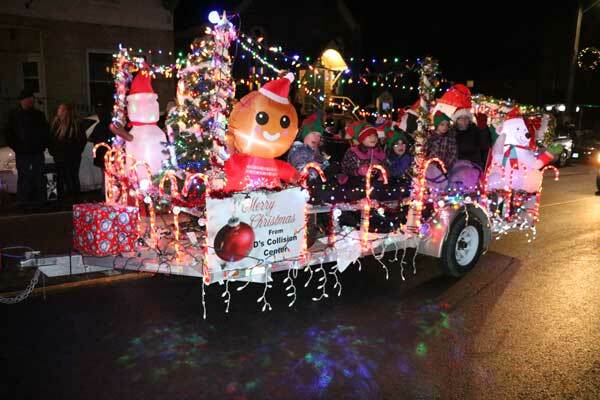 List will be updated as floats are registered. Please keep checking back! Rocky Road Rescue is a non-profit organization that is solely run by volunteers and is dedicated to finding the best possible forever home for all types of dog breeds. Private patient transfer company local to the SD&G area. Lia McIntosh with her miniature horses, Ellie and Adele. The Home Coming Float will display a mother reading letters from her two children, unaware they will make it home from the war for Christmas. The Capital Cowgirls won the Best Animal Float in our 2018 parade. Their entry included a trick rider and a float decorated in a horsey theme. Float winners each get a gift basket with gifts from local businesses. Alternatively, you can download our Parade Entry Form (opens in PDF), print it, fill it out and return it to the Township Office. Candy is not to be thrown from your entry. If you wish to distribute treats, please have someone walk beside your entry to hand them out. Try to illuminate your towing vehicle as well as your float. Identify your entry by visibly displaying your name, your company name, and/or your sponsor’s name. This assists the announcers and identifies your entry to the crowd. The number assigned to your entry must displayed on the passenger side of your dashboard. If you plan to drop off your float early and leave it, please have an organizer advise where to park it. 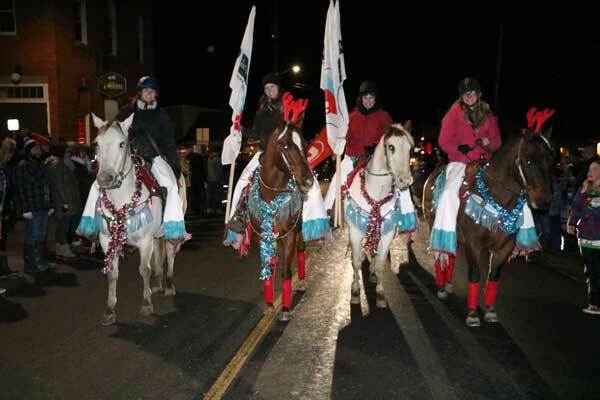 The parade will assemble at the North Dundas Township yard at 636 St. Lawrence Street, Winchester. The yard will open at 4 pm. All entries must be in the yard by 6:30 pm. Upon arrival, please check in with the parade organizer. All vehicles that are not part of the parade must be parked off-site. A drop-off zone will be available near the entrance. Volunteer firefighters will act as parade marshals along the route to assist with crowd control. Hot food and drinks, courtesy of a local non-profit group (TBD), will be served inside the Township Office from 5:00 to 6:30 pm. Donations are appreciated. Alternatively, you can download our Parade Entry Form (opens in PDF) in PDF), print it, fill it out and return it to the Township Office.